There's more to terroir than the dirt that grapevines grow in, even if that dirt is a particularly dramatic dirt, like the dirt in the picture on Arpad Molnar's cell phone. Molnar points to a foot-wide fissure that the South Napa Earthquake opened up in his family's Poseidon Vineyard, which is situated directly above the quake's epicenter. That's crazy dirt, but in the Carneros, it's the cool breeze from nearby San Pablo Bay that keeps the Poseidon Vineyard 2013 Estate Chardonnay ($26) bright with acidity. And where do those intriguing, spiced orange tea notes come from? Molnar hands me a chunk of obsidian—weathered but sparkling blackly—from the family's Lake County vineyard. Volcanic soils and high elevation intensify the juicy cassis flavors of the Obsidian Ridge 2010 "The Slope" Cabernet Sauvignon ($45), and contribute to the cool aromas of mint, fragrant eucalyptus and chewy, blueberry and blackberry fruit of the Obsidian Ridge 2011 Lake County Syrah ($30). But that's not the last word in terroir at Tricycle Wine Partners. On the tasting room's tree-shaded deck, Peter Molnar plunks a slab of light-colored rock on a table. It's andesitic tuff, formed millions of years ago in what is now Hungary. Specifically, it underlies the forests of Tokaj, the source of all oak barrels that Poseidon and Obsidian Ridge wines are aged in. Brothers Arpad and Peter Molnar, whose father escaped Hungary after the failed revolution of 1956, returned to their ancestral land in the early 1990s. "It was a really exciting time," says Arpad, with a gleam in his eye. They soon developed a business venture with a co-op cooperage, one of the few employee-owned businesses that was not totally privatized. With capital from the Molnars, Kádár Hungary grew and is now partnered with French barrel biggie Taransaud. Peter is unfazed when asked if Hungarian oak, which is less expensive than French oak, might be seen as second-best by consumers. After all, they've got 150 winery clients in the United States, and French and Hungarian oak barrels are made from the same species of tree, Quercus robur and Quercus petraea. Moreover, the slow-growing Tokaj forests—sustainably managed since a 1769 decree by the Holy Roman Empress—produce a tight-grained, spicy oak that was used centuries ago in Bordeaux, and is prized for its mid-palate characteristics. "Let's put it this way," Arpad interjects. "Winemakers are more adventurous than most consumers." 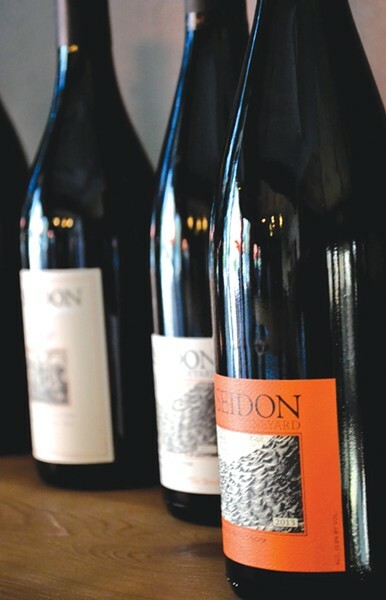 Indeed, there's that orange spice again, cropping up in the Poseidon Vineyard 2013 Carneros Pinot Noir ($32). Light and lively, it's a nice enough Pinot—and one with a whole world of terroir. Tricycle Wine Partners, 23568 Arnold Drive, Sonoma. In Cornerstone Sonoma. Open daily, 11am–5pm (weekends to 6pm). Tasting fee, $10. 707.255.4929.